You might be wondering, Who did the cutting of August’s beloved man bun? But first, a bunch of things I don’t care about all that much. Sorry Jay, but the drama of your TV show pitch (which, by the way, took only one episode to prepare and schedule?) is not doing it for me. The issue here is that Jay pitched Quinn on Alexi the Russian bad-boy ballerino as the host of his new show — which actually secretly stars his boyfriend, Xavier, a New Orleans bounce star who definitely doesn’t know he’s already been upstaged. Hollywood! Alexi also doesn’t know he’s the host of a new show being pitched to Quinn’s overlords, because Jay hasn’t found the right opportunity to actually tell Alexi yet, as he explains to Rachel. “Whatever you’re doing with Alexi, keep it up!” Quinn says to Jay, who will later walk in on Alexi doing coke. Hmm, well that makes things tough. But to keep the dream of his dance show alive (and his gig on UnREAL), Jay gets Alexi more of his drug of choice if he’ll agree to host. He agrees. Back to the man bun. Even the crew of Everlasting knows this plotline is trash, playing it up only to distract a journalist Chet invited on set to help with his “Emmys campaign.” I get why he’s doing this — he wants to put pressure on Quinn to air the segments he and Rachel shot, or whatever — but is that really worth bringing someone to set whose job it is to dig up dirt, on a show where all they have is dirt that could literally land them in jail? She’s a good journalist, too, scamming her way into an interview with Serena and then setting her focus on Quinn, to whom she says, “It’s so interesting that you position yourself as this feminist hero. Because I think what’s really happening is that you hate yourself and you’ve made it your life’s work to destroy other women. That’s the real story. The real story is you.” Thank you! Someone is finally pointing out the fluctuating feminism that flows through the halls of Everlasting, how it’s used to defend and scorn with a definition that changes at everyone’s convenience. 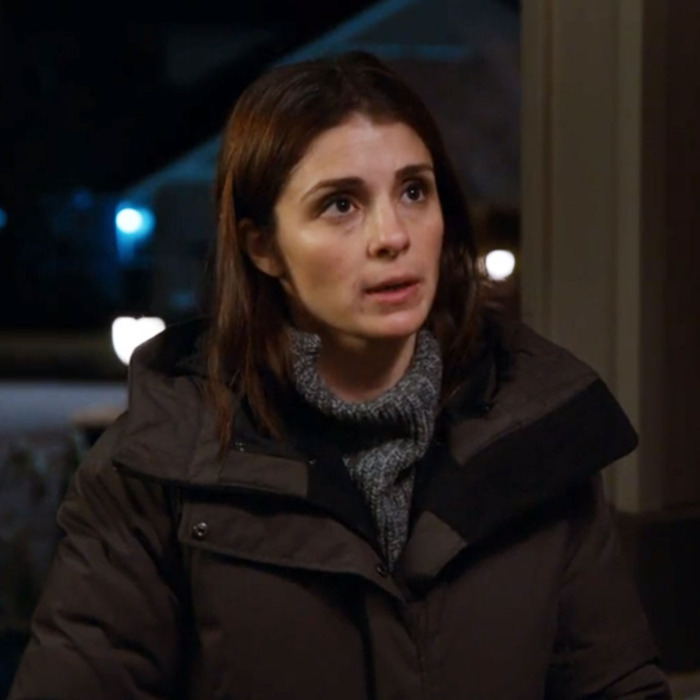 But the most compelling thing on UnREAL, Quinn and Rachel’s relationship, is a total mess. “Don’t you want me to get better,” Rachel asks Quinn. To which Quinn replies: “Of course I do! Can’t you just wait until after the season’s over?” It’s true on so many levels: Quinn knows that a “better” Rachel makes for a not-so-good Everlasting. But does it also make for a not-so-good UnREAL? Or would a “better” Rachel give her character some reliability, the strength to really mix up the show? Either way, they have to work together to keep Serena in their good graces. After the reporter overhears Rachel talking to Alexi about how she produces the guys to “like” Serena (I mean, this is kind of her job), she tells Serena and then Serena confronts the “essentially honest” Rachel. She has to be honest, but she also has to keep Serena’s trust. So she spills, telling Serena that Alexi doesn’t actually like her … and that August slept with Quinn. Yikes. Quinn confirms, though: She realizes that her playing the “bad guy” just means that Rachel remains the “good guy” and Serena is still under her thumb. In the land of the missing man bun, we find out that the viral star Zach did it. Or did he? (Side note: Did you know the actor who plays him is also a former Vine star?) He says he did it, and security camera footage shows that he did it … but Billy still protests. They want to finally get rid of Billy, and here’s their chance. And so, they take away his moment to “shine” — even if it’s for giving an unwanted haircut. Bye bye, Billy! Something that Dr. Simon says to Quinn about Rachel echoes throughout this episode: “Sooner or later, she’s gonna blow.” He appears to be right, as Rachel’s honesty bit takes her to the door of her the guy whose face she couldn’t escape. He’s her abuser, her shrink mother’s patient who molested her when she was 12 years old. He remembers it differently: You wanted it, he says, and you were 17. He breaks down, apologizes, and tells her that her father went after him and beat him up. Her father knew everything and never told her. Dr. Simon’s warning rings more clear than ever: Sooner or later, Rachel is gonna blow.